Cefpirome Sulphate Sterile Powder for injection <?xml:namespace prefix = st1 ns = "urn:schemas-microsoft-com:office:smarttags" />0.25g, 0.5g, 1g, 2g vials. Hospital and community-acquired infections caused by bacterial organisms sensitive to cefpirome. Lower respiratory tract infections (bronchopneumonia, lobar pneumonia); complicated upper (pyelonephritis) and lower urinary tract infections; skin and soft tissue infections (cellulitis wound infections); bacteraemia/septicaemia and severe infections in intensive care patients; infections in neutropenic and immunocompromised patients. 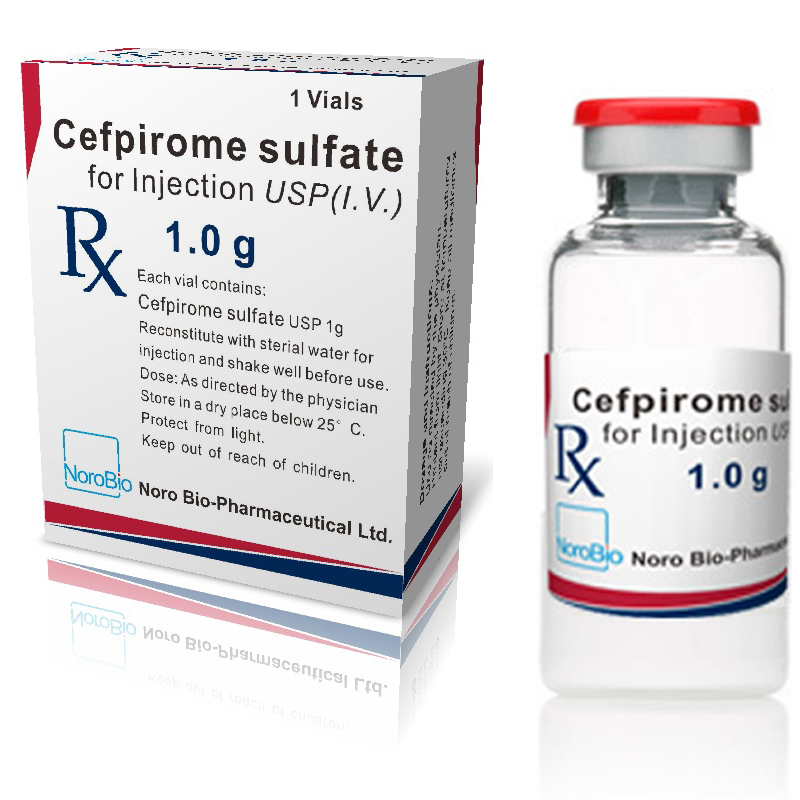 Cefpirome is to be used by the parenteral route, the dosage, mode of administration and duration of treatment depending upon the severity of the infection, sensitivity of the pathogens, condition of the patient and renal function. For urinary tract and skin and soft tissue infections, the unit dose may be increased to 2.0g in very severe cases. Cefpirome is excreted principally by the kidney. The dose must therefore be reduced in patients with impaired renal function to compensate for the slower excretion. The following doses are recommended for creatinine clearance. No adjustment is required unless renal impairment is present. The contents of one vial of 1.0 or 2.0g cefpirome are dissolved in 10 or 20 ml sterile water for injection respectively, and then injected over 3-5 minutes either directly into a vein or into the distal section of a clamped-off infusion tube. For patients with renal impairment, 0.25 or 0.5g cefpirome are dissolved in 2 or 5 ml of water for injection respectively. The contents of one 1.0 or 2.0g vial of cefpirome are dissolved in 100 ml sterile water for injections and then infused over 20-30 minutes. The following infusion solutions may also be used: 0.9% sodium chloride solution, Ringer's solution, standard electrolyte infusion, 5 to 10% glucose solution, 5% fructose solution, 6% glucose + 0.9% sodium chloride solution. Effervescence occurs on dissolution of cefpirome, and the vial has to be tipped gently from side to side for approximately 1 minute before cefpirome is completely dissolved. A pale yellow, clear solution is formed when the sterile powder is dissolved in water for injection. The vials containing the solvent and powder for reconstitution should be held horizontal when preparing the infusion solution, and the cannula should be inserted rapidly. The amount of 100 ml solvent must be adhered to as precisely as possible. The vials are manufactured under slight negative pressure. The negative pressure facilitates the addition of the solvent. Carbon dioxide is released when the solvent and the powder for reconstitution are mixed, and an increase in pressure occurs. The solution may still contain bubbles of carbon dioxide, but these have no adverse effects on efficacy. Cefpirome should not be used in children until adequate clinical experience has been gained.